Velvet is a timeless fabric, which instantly brings a refined touch and chic to any space and look. It’s very popular for decorating any space for fall or winter as it’s also very comforting and warming up, it’s great to add texture to your interior. As fall is almost here, it’s high time to spruce up your interiors with luxurious velvet pieces, and today’s roundup is dedicated to them. We are featuring cool velvet furniture pieces and pillows that are sure to spruce up your spaces, take a look and get inspired! The first roundup is for those who already have a proper velvet furniture item but it’s old or just not in the best shape. This tutorial will tell you how to repaint a velvet furniture piece with paint keeping its texture soft as it is. Watch a video tutorial and give your velvet piece a new life and your space a chic and bold addition. Here’s another tutorial to make an old velvet piece – here it’s a chair – brand new and fresh. If you don’t have a reupholstery budget or don’t have skills and time for that, go for repainting. This tutorial shares all the secrets to make the chair amazing again and keep the texture of the fabric. 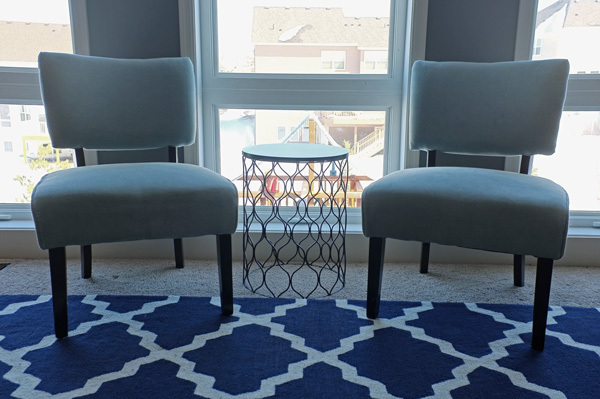 Even if your piece features diamond upholstery, you can do it, get inspired! Create a bold decor statement piece for your home painting the chair in half. 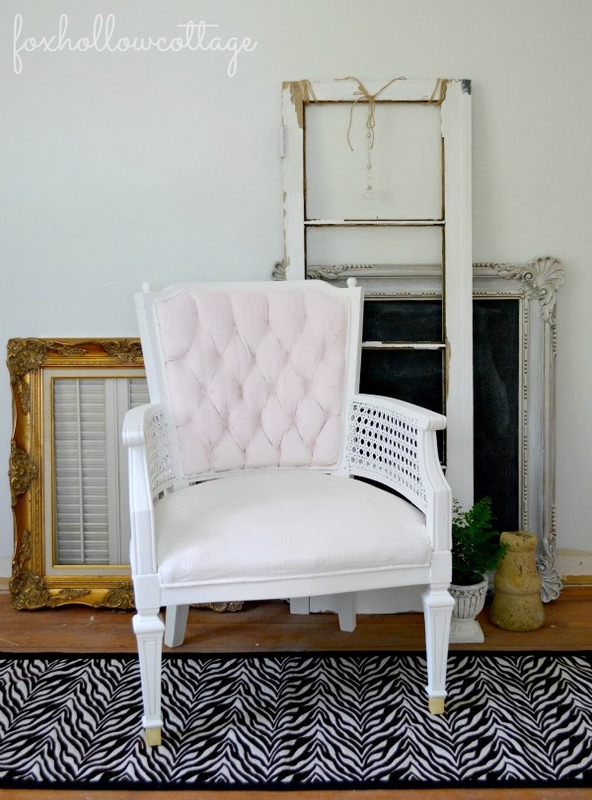 The idea is about taping off one part of the chair – make it vertical for a bolder and catchier look. Then paint one half of the chair in some contrasting color and voila – you have a real bold and modern statement piece. Enjoy! If you don’t have a stylish velvet piece for this fall and still want it, no problem! Take a usual sofa and reupholster it with gorgeous velvet to achieve a chic and bold look. 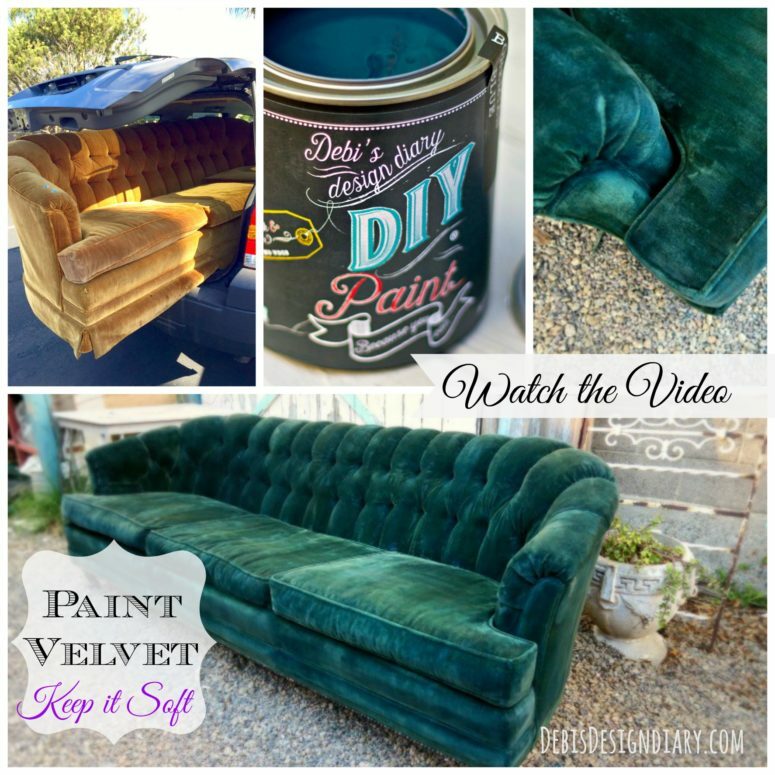 This tutorial will tell you how to reupholster a sofa with stylish and bold velvet making it amazing and trendy. 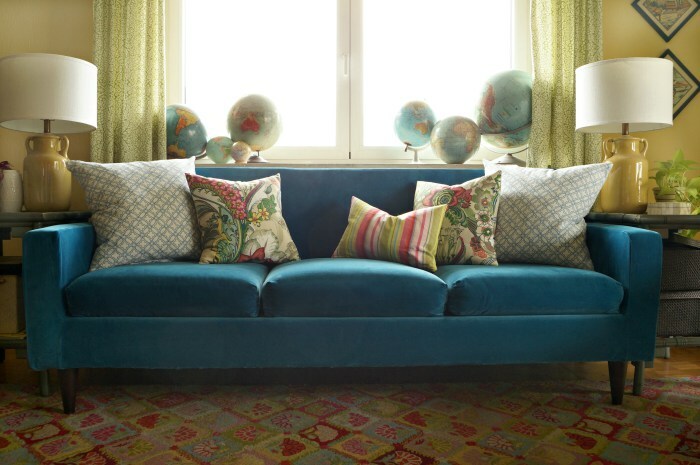 Spruce up your living room with a chic velvet sofa of some jewel tone! 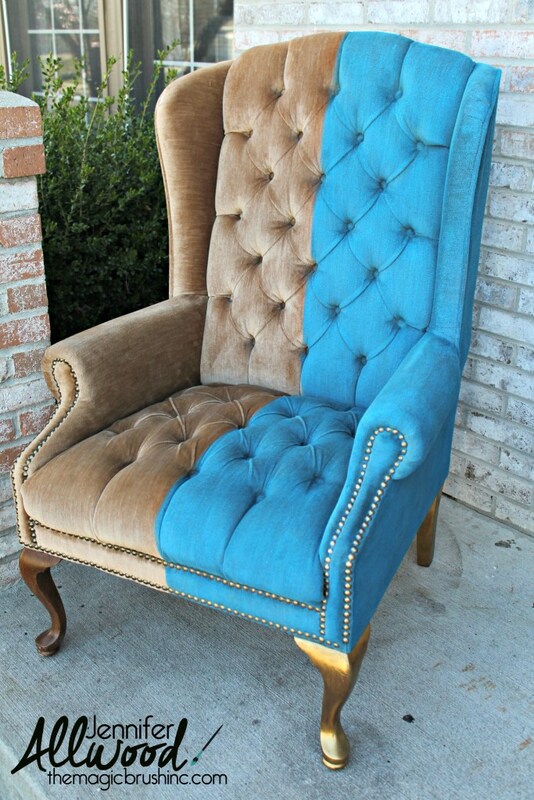 Any old chairs can get a super trendy and bright look if you reupholster them with chic velvet. This project will tell you how to renovate old chairs with velvet of your choice – it’s a good idea even if the chairs are new but you’ve spoilt something on them and can’t clean. 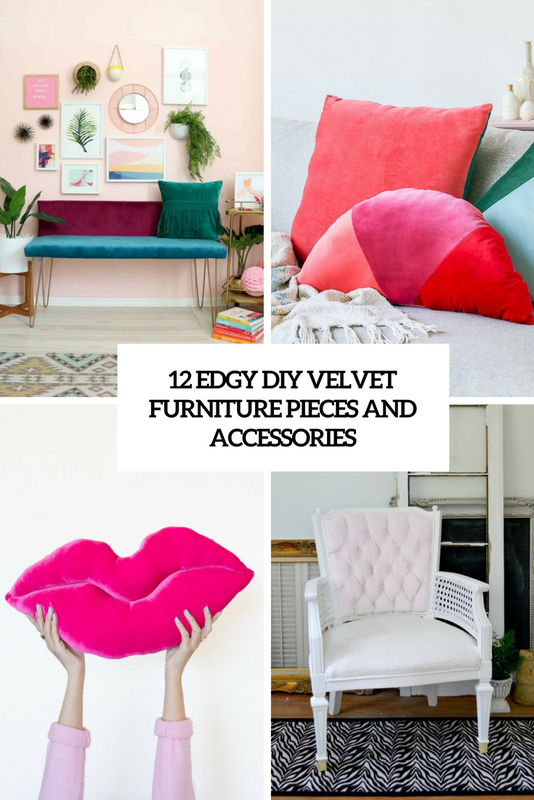 Read how to make them brand new and cool and refresh your space with new velvet chairs. 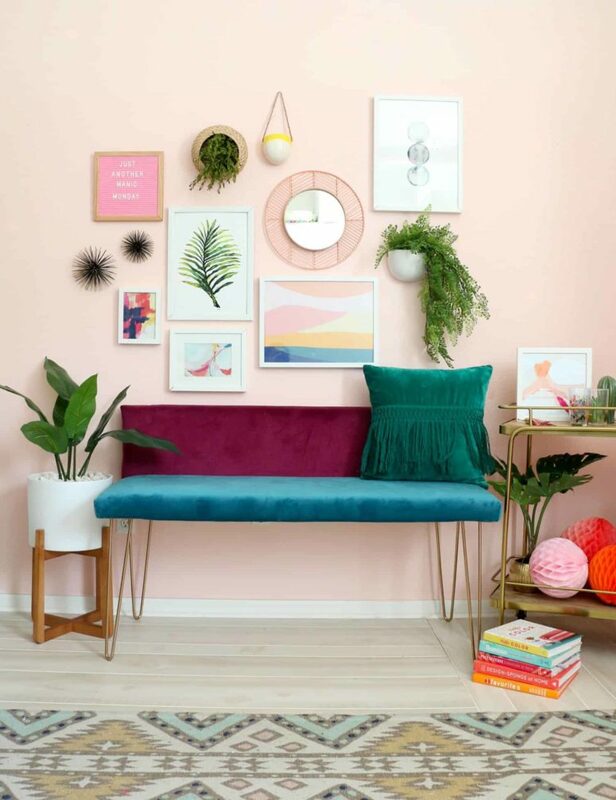 This bold bench is trendy from each side: it’s a color block piece, which is a hot trend, it’s velvet, which is another trend, it has pin legs, which is also edgy and features jewel tones that are amazing for the fall. What a gorgeous piece! It’s a tall bench on metallic hairpin legs and shows off bold plum and teal velvet – an amazing item for many styles and decor and for lots of spaces. Get inspired and make one. Velvet isn’t only about large pieces of furniture, it can be easily incorporated into home decor with little touches of soft here and there, for example, cute geometric throw pillows. 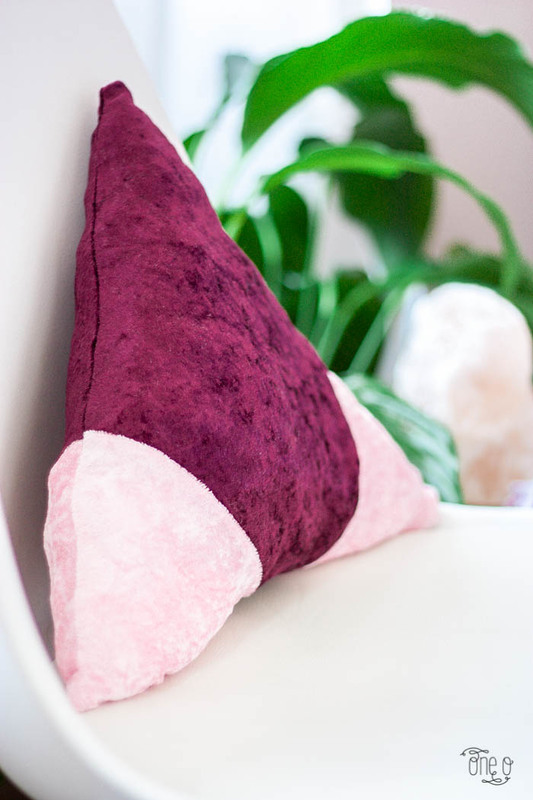 This bold velvet pillow is a modern color block piece in pink and plum, it’s sure to add texture and interest to any space and a modern geometric shape adds even more. Here’s a velvet pillow, it’s a bold and girlish piece! 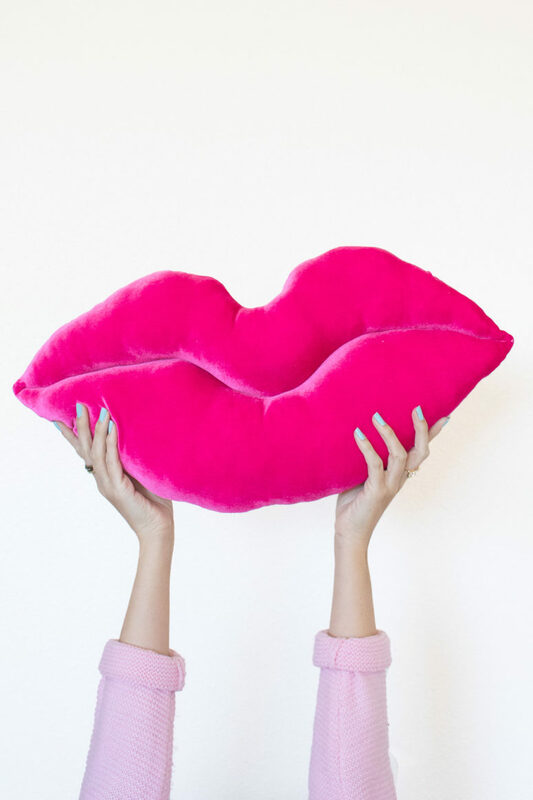 The pillow is shaped as lips and is bright pink, which I like a lot. If you too, girls, it’s time to make one of pink velvet. Vary the color of velvet if you prefer other shades of lipstick or make several ones to change them according to the mood. Get inspired to add a glam touch to your space with these lips! Make a pack of amazing pastel velvet pillows to spruce up your space with them and add cute little tassels on the corners for a boho feel. 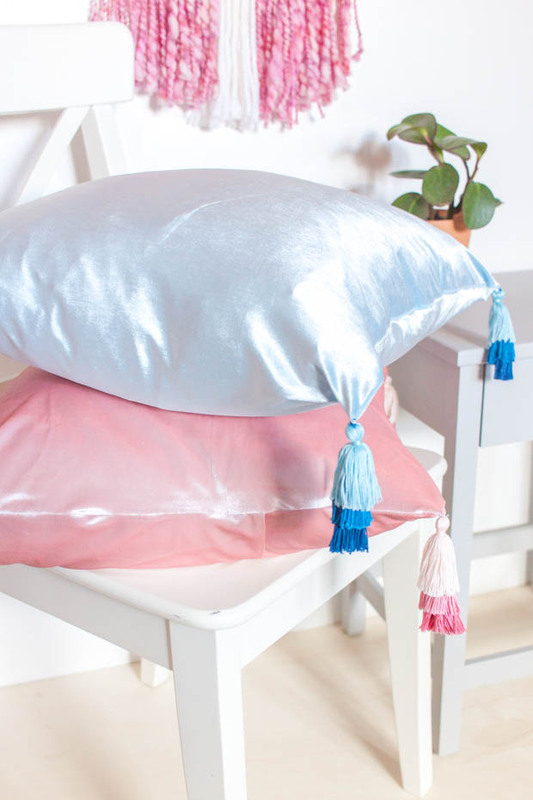 This tutorial tells how to sew several pillowcases of pastel velvet and attach ready tassels or make them yourself and then attach. Read how to sew them and spruce up your space with these cute accessories. Here’s one more bold color block project – it’s sure to spruce up any space with its bold shades. Take velvet of bold jewel tones, any shades that you like but keep them contrasting. 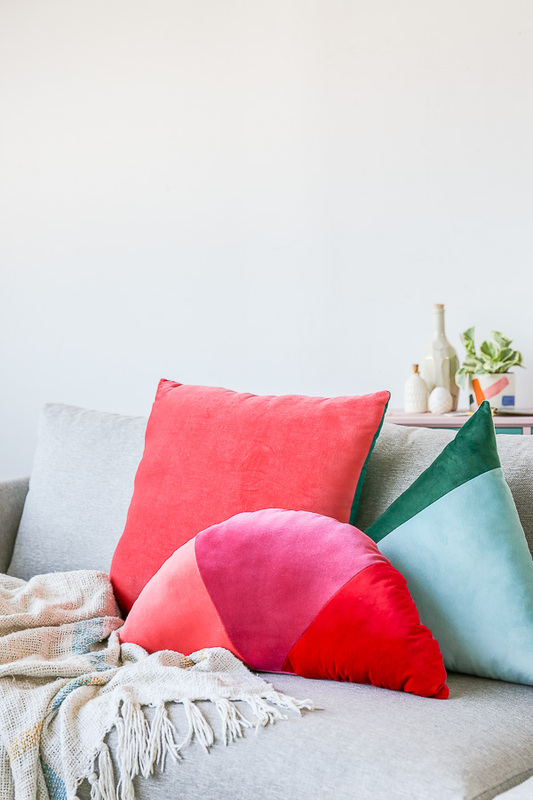 Follow the instructions to make the geometric color block pillows easily, get inspired and enliven your space for fall with jewel tones! 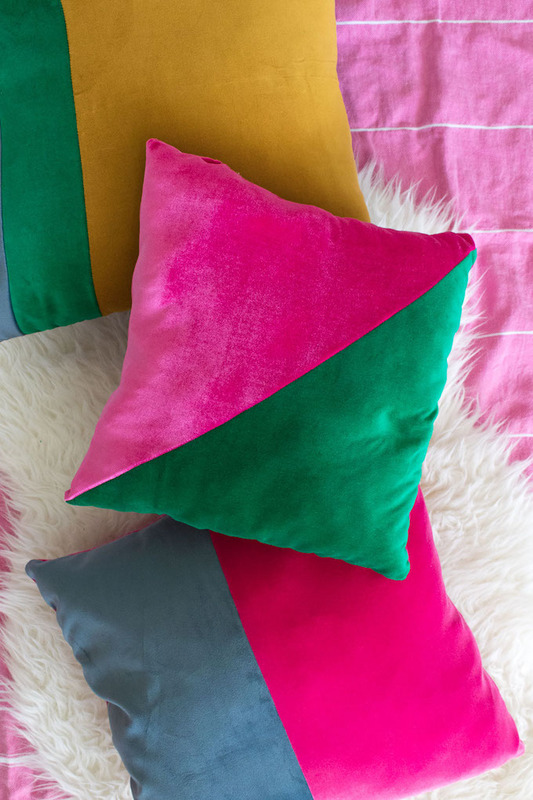 Make a bright color block semi circular pillow of velvet! Sew such a pillow of bright and contrasting velvet of your choice dividing it in sections as it’s stated in the tutorial. You may make several color block pieces of different shades to add interest to your space. 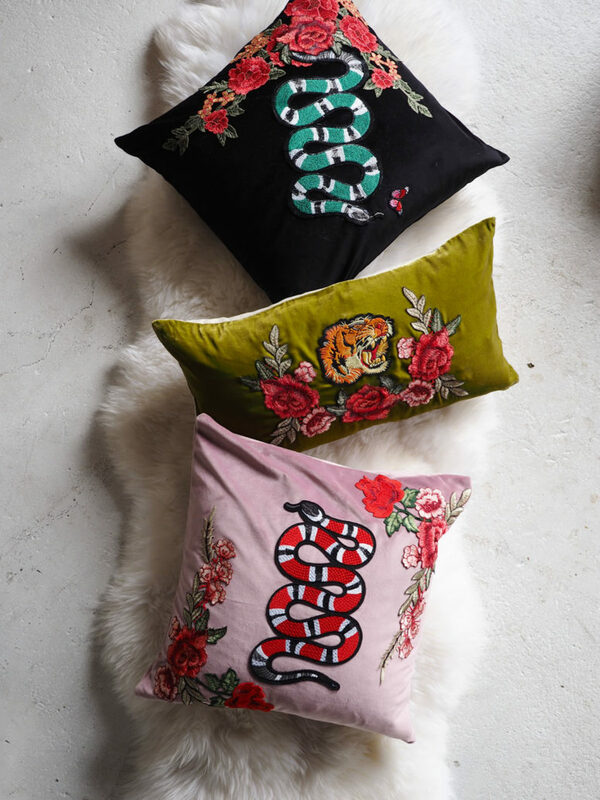 If you already have some velvet pillows but still think they aren’t bright enough, read this project and fulfill it – it will tell you how to spruce up the pillows with bright appliques. You may choose any or even cut out them yourself and then attach adding any style to the pillows. Get inspired!